The Land Down Under has plenty of opportunities for underwater adventures. Whether you are a new diver or already an expert, the options for scuba diving Australia is abundant. Regardless if you are looking for shallow reefs, colorful marine life, or intriguing wrecks, there is something for everyone. So, if you are looking for the best destination for diving in Australia, we got you covered in the rest of this post. Pack your wetsuits, scuba fins, and other diving essentials, and jet off to Australia! When you talk about scuba diving Australia, it is impossible to not mention The Great Barrier Reef. In fact, it is considered the heart and soul of diving in the country. After all, it is the largest coral reef in the world, making it on the bucket list of many divers! It is also one of the seven wonders of the natural world. Plus, it is the only living thing that you can see from space! This massive reef covers a total area of 344,000 square kilometers. For an accurate picture of how big it is, that is comparable to the size of 70,000,000 football fields! Massive, right? There are more than 3,000 individual reefs. It also attracts more than 2,000,000 people annually! However, it is sad to know that in recent years, the ecosystem has been experiencing a decline, which is because of climate change. It is believed that almost 50% of its corals were lost. Nonetheless, since it is massive, it is sure that there is still plenty for you to see. If you plan to go scuba diving at The Great Barrier Reef, your point of entry is Queensland, which occupies about a quarter of the entire country. The weather is tropical, so you can expect the water to be fairly warm throughout the year. No need to think about how to stay warm when scuba diving! The temperature can be mid 20 degrees and mid 30 degrees in the winter and summer, respectively. There are plenty of dive sites that you can find in The Great Barrier Reef, including some that will be discussed separately later on. One of the most popular is the Whitsundays, which has 74 islands, making it the ideal destination for a tropical holiday. Like the Great Barrier Reef, Ningaloo Reef is also a world-renowned dive site. It is a World Heritage site. It is also considered the largest fringing coral reef in the world, making it another must-have in your itinerary for scuba diving Australia. The reef has a total length of 260 kilometers. Among others, one of the best things about diving in Ningaloo Reef is that you can swim along the gentle whale sharks. They are giant but gentle, making them the main attraction in the reef, despite that fact that it is home to more than 500 fish species. April to July is the best time to visit. Make sure that you are familiar with scuba diving with sharks before you go! The reef is also known for sightings of humpback whales. The best time to go is from July to October if you want to see these whales during their migration. However, take note that only five people are allowed to swim with the whale at a time. Diving here is fairly easy since the reefs are accessible. Most of the corals are not offshore. In fact, in some places, within just a few steps from the shore, you can already see lively corals. As it is rich in marine life, do not forget to bring your diving camera and lenses for underwater photography. You will see manta rays, whale sharks, and turtles, among others. Located in Western Australia, it is quite remote but well worth the trip. It is near the rim of the deepest point in the Indian Ocean, the Java Trench. As home to one of the longest drop-offs in the world, this is a perfect choice for adventure seekers. In the northern coast of Christmas Island, you can revel in the beauty of some of the best corals in the world, including Acropora. Plate corals are also abundant. These corals house diverse tropical marine species, including eel, butterflyfish, surgeonfish, anemones, and gobies. It is also known for the presence of whale sharks. These gentle giants can be seen from November to April. A lot of the walls in Christmas Island can be seen only about 20 meters from the shoreline, so there is no need to travel far before you can dive. Because the coral reefs are just near the islands, this is a great place to don your snorkel masks. If you are looking for wreck diving, Christmas Island can also be a good choice. One of its main attractions is the Eidsvold Wreck, a Norwegian phosphate ship that sank during the World War II. For those who are into cave diving, one of the best spots to check out is Thundercliffe Cave. There is an underwater entrance to the cave and the rest can be explored on foot. Before you go, take the time to read this cave diving guide. Looking for an outstanding marine reserve in Australia? For sure, you will never run out of choices, and one place that should be on your list is Julian Rocks. It is located only 2.5 kilometers away from the shore of Byron Bay. You can go diving throughout the year but expect different environments depending on the season of your visit. If you dive during the winter months, you will most likely see grey nurse sharks, which are present to breed. They may look dangerous and intimidating, but truth is, it is perfectly safe to dive with them. When you dive in spring, you will most likely spot a blue tang, a fish with a blue body and yellow tail. During summer, when the water is at its warmest temperature, you can spot leopard sharks. During summer and start of autumn, you can also see manta rays. Year-round, there is plenty of opportunitities to spot diverse marine life in the area, including sea turtles, eagle rays, wobbegong sharks, and kingfish. Hard and soft corals are also abundant. This scuba diving Australia destination is located approximately 110 kilometers from the northern tip of the Great Barrier Reef. The shape of the reef is roughly oval and measures 25×12 kilometers. The total area coverage of the reef is 195 square kilometers. Meanwhile, the depth of the central lagoon is 30 meters. The most popular part of the Osprey Reef is known as the North Horn. This is where you can go diving with whitetip sharks and grey reef sharks, making it a thrilling experience. Another highlight is the natural underwater amphitheater, which provides the opportunity to watch the sharks as they feed. The amphitheater has a depth of 20 meters. Before you head, take note that it is a remote site, so it isn’t as accessible as most of the places that are included on this list. There is a high standard to the liveaboards that are allowed in the area to guarantee the highest level of safety of divers. These liveaboards can get full quickly, so make sure that you book in advance, especially if you plan to travel during the summer months. Recognized as one of the top 10 destinations for diving in Australia, Lord Howe Island is another place that should not be missed for an underwater exploration of Oz. This UNESCO World Heritage Site is located 700 kilometers northeast of Sydney. One thing that you’ll love about the place is the fact that it is never crowded. This is because of a law that limits the number of visitors to only 400 at a time. The island has only two main dive operators, but you can be sure that you are covered. If you need scuba masks, scuba BCDs, and dry suits, among other dive essentials, the dive centers have got you covered. There are five ocean currents that converge at the island, allowing it to create a unique ecosystem. It houses more than 500 fish species. You’ll never run out of choices on where to go since there are about 50 dive sites. Many of these sites are easily accessible, with some being about ten minutes from the shore. One of the best places to explore is the Admiralty Islands, which has a depth of 18 to 30 meters. For the experienced divers, one of the best places is Ball’s Pyramid. It is home to the tallest sea stack in the world. Advanced certification is needed if you want to dive. Some of the marine species that you can see here include kingfisher, silver drummer, and rainbow runners. Galapagos whalers are also common. This is a part of the Great Barrier Reef, which is why you can expect that it will also be huge. While diving is first-class, renting equipment can be difficult unless you are staying in an exclusive resort. So, it is best to pack your own dive regulators, dive safety gear, and other scuba essentials. Among others, one of the most popular spots to explore at Lizard Island is the Cod Hole, which is located approximately 45 minutes from the shore. This is where you can see potato cods, grey reef sharks, and schools of tropical reef fish. As you venture a bit outside of Cod Hole, you will find Yonge Reef. Its depth usually ranges from 5 to 20 meters. Here, you will see whitetip reef sharks and moray eels. Dynamite Passage will also be worth your time, which is about 45 minutes away from Lizard Island. Some of the marine species that you can see here include moray eels, garden eels, and cuttlefish. Privacy is one thing that attracts visitors to Lizard Island. It is home to 24 beaches, but there are only 40 suites and villas, making it the perfect choice if you want to be away from the crowd and you do not mind going on a splurge. The reef is just nearby the accommodations, so you do not need a long boat ride before you can dive. Another part of the Great Barrier Reef, it is considered by many to be the best wreck in Australia, making it another must-have in your diving bucket list. It is also recognized as one of the best shipwreck diving destinations in the world! The SS Yongala is a 110-meter ship that sank in 1911 following a tropical cyclone. All the 122 people onboard died. The ship, however, was found only 50 years after it sank. It is considered as a sunken grave site since all the bodies remained inside. Because of this, you are not allowed to go in, so you can only dive from the outside. There is a high fine for breaking this rule! There are almost 10,000 people who explore the wreck annually. There is a strict limit on the number of divers allowed, which makes the site well-preserved. During your dive, make sure to spot VW, a Queensland grouper named as such because its size is similar to that of a small car. The wreck is also home to olive sea snakes. They are known as amongst the world’s most venomous snakes. However, they do not attack, so there is no reason for you to be scared! This is also an excellent option if you want to try night diving in Australia, providing an opportunity to see nocturnal animals. Nicknamed Australia’s Natural Zoo, Kangaroo Island is one of the best places in the country to have an up-close encounter with wildlife. The island has 509 kilometers of coastline, making it one of the best places for a tropical vacation. If you are visiting Kangaroo Island, the most popular point of entry is Kingscote. From here, you can easily access some of the best experiences that the island has to offer, including scuba diving Australia. The best time to visit Kangaroo Island is from November to March. During this time, the average water temperature is 17 to 21 degrees Celsius. This is also the perfect opportunity to encounter New Zealand fur seals and leafy sea dragons. If you had too much of underwater adventure, there are also plenty of non-diving activities that you can enjoy at Kangaroo Island. One that you should not miss is the Flinders Chase National Park, which is the perfect location to interact with kangaroos roaming wild. KIS Distillery is also worth visiting, which is known for their chili-infused vodka and honey walnut liquor. The Seal Bay Conservation Park is another place that you should not miss. This is the only beach in the world where you can be one with the Australian sea lions. They are already endangered, so take the time to see them while you are in the area! It is composed of two main islands – North and South Neptunes. It is a popular choice for people who are on the lookout for remote diving in Australia. Its far location is a plus since it means that it isn’t one of those places that are crowded, especially during the summer months. One of the main reasons why people go to the Neptune Islands is to try cage diving with great white sharks. The cage will be submerged at 60 to 80 feet to hover along the seafloor. While you are inside the cave, you will have an up-close encounter with white sharks in their natural environment. Aside from the sharks, there is also a chance to spot sea lions and stingrays, among others. The best time to visit the Neptune Islands is from May to October. This is the viewing season. The average water temperature is 16 degrees Celsius. If you want to see the biggest sharks that flock the area, the best time to go is between June and August. From November to May, the water is warmer with an average temperature of 20 degrees Celsius, but this isn’t a good time to see the sharks. One of the best things about cage diving at Neptune Islands is that it is open even for non-divers! 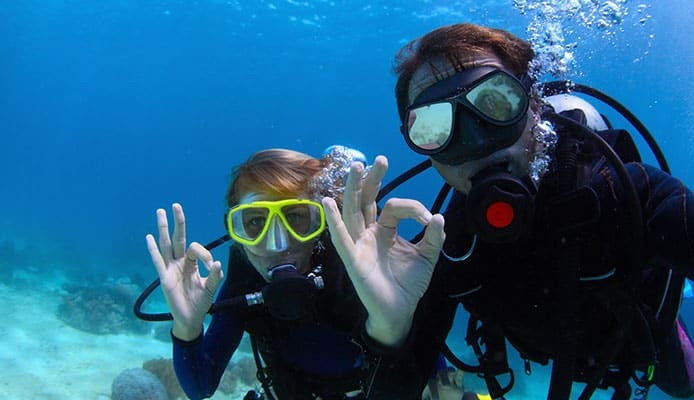 There is no need to have your open water certification if you want to go for a dive. There are experts who will take care of you during this once-in-a-lifetime adventure. Regardless of where you are in the six states of Australia, you will surely find a diving spot with astounding beauty. It does not matter whether you are a novice or an expert, diving in Australia is for everyone! 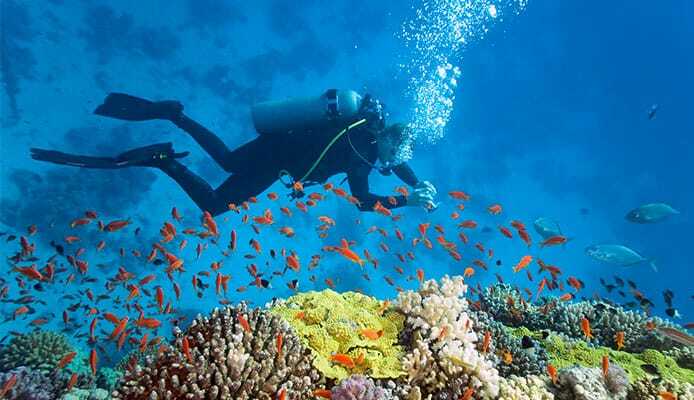 Head to one of the places mentioned above and be mesmerized by the country’s underwater allure!